DL haircuts are designed to you—the shape of your head and facial structure, your hair type and most importantly, your personality. Your experience begins with discussing your needs, wants, hair history, and your hopes for your next cut, which together determine your personal hair design. 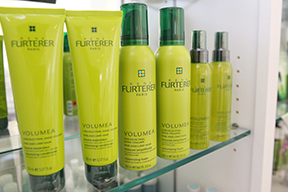 Next we treat you to a luxurious shampoo head massage with carefully chosen Rene Furterer shampoos. For the hair cut itself, we use both wet and dry cutting techniques for sculpting and precision to bring out the character and personality of your hair. Your custom cut is finished with a beautifully styled blow dry that will last for days. For long hair, Debora specializes in custom tailored long haircuts. For hair that reaches mid-back or longer, Debora works to manipulate the angles of your hair to work with its texture, blend the layers and fit both your face and your body frame. Due to the time, care and customization that go into Debora’s long haircuts, these cuts are usually around $135. For a simpler cut or long hair trim, we suggest you book an appointment with a senior stylist. For short hair, Debora’s specialty is hair “sculpture.” For mid-length and shorter cuts, she works to sculpt the hair to fit the shape of a client’s head and create the perfect silhouette. Short and mid-length haircuts are usually around $105. Sarah’s vibrant personality is clearly expressed in her haircuts which have both character and style, exhibiting her technical skills and artistry. Sarah is a master at making you feel comfortable and able to express your vision for a perfect cut. Her clients leave happy, laughing and beautiful!